At the beginning of the XIVth century, the Chiesa della Madonna degli Alemanni, a very ancient church with an underneath oratory, was standing on the very spot of the hotel. The church was on the present hall floor, while the oratory was on the lower floor. The two structures were connected by a staircase which is still linking the two floors. 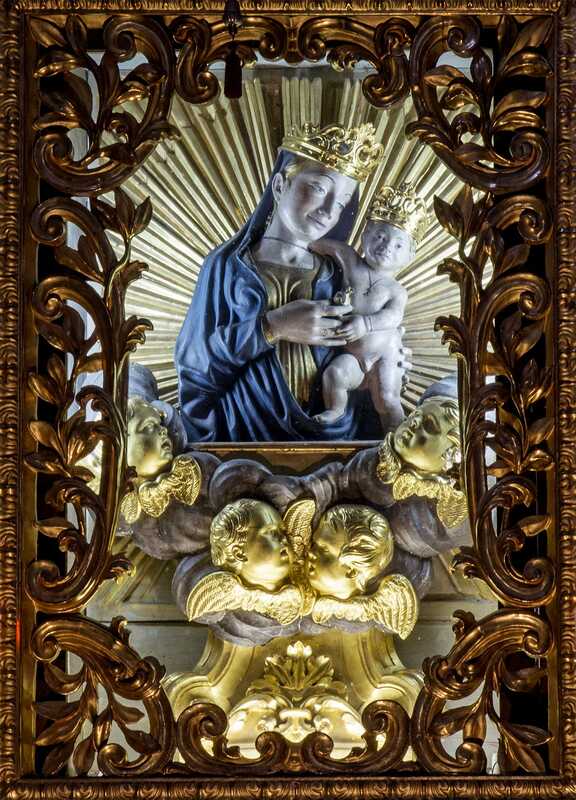 In the origin, the church was a place of cult and devotion: people went there to worship a miraculous simulacrum representing the Virgin’s bust with the Child (Madonna della Manna). It is a XIVth century terracotta which is actually on display in the Duomo di Cortona. The church was decorated with remarkable works of art; besides the above mentioned terracotta, there was a big picture representing Our Lady of the Assumption. This painting, which was attributed to Andrea del Sarto, is now stored in the choir of the Duomo di Cortona. There was also a wooden crucifix, by F. Fabbrucci, with its finely carved case which is today housed in the Chiesa dello Spirito Santo in Cortona. 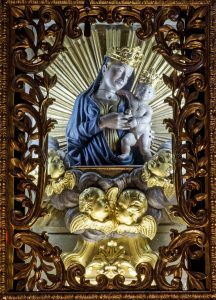 The cult of the Madonna degli Alemanni was so widespread and deeply felt that the church proved to be too narrow to host its devotees. The church was thus knocked down in 1730 and a new, bigger one was erected in its stead. It was decorated with stuccoes and frescoes whose main remains is a Madonna with S. Andrea Avellino, by the artist F. Fabbrucci from Cortona (XVIIIth century). Among the original church’s remains, two gothic capitals and two frescoes are particularly worth mentioning. They are now housed in the Istituto delle Suore Serve di Maria Riparatrici, in Via G. Severini, just opposite the hotel. The first fresco, from Bartolomeo della Gatta’s school (XVth century), where the Virgin with the Child is painted on a tile just in front of an oak, is generally known as “Madonna della Quercia” (The Oak’s Virgin). The second fresco, whose author is still unknown, represents Giobbe and is dated 1504. On the 8th of October 1741, a solemn ceremony took place in the Duomo di Cortona to pay homage to the image of the Madonna degli Alemanni and the Child. Later on, the demolition of many small churches was ordered by the Archduke Leopoldo di Toscana. The church of the Madonna degli Alemanni was thus knocked down in 1786. In its stead, a gentleman’s residence was built (Villa Marsili) looking about the same as the present hotel.